This recipe is an adaption of the recipe as described in the book ‘Flatbreads & flavors’ by Jeffrey Alford and Naomi Duguid. This book is getting close to being 20 years old but I can still recommend buying it. 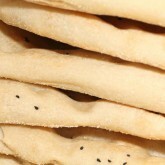 It is truly the bible of flatbreads and gives no end of inspiration and cultural background information. Traditionally these breads are made in wood fired ovens but the most important thing for the home baker is to at least, if possible, bake it on stone or tile. 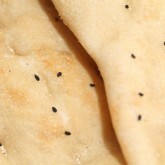 Next to the shape, the most distinguishing element of this bread is the addition of the nigella. These seeds have a very distinctive flavor and smell. 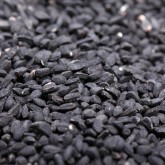 Some say these black seeds taste like a combination of onions, black pepper and oregano, and have a bitterness to them like mustard seeds. I must say I find the taste hard to describe, but I am totally enamored with it. 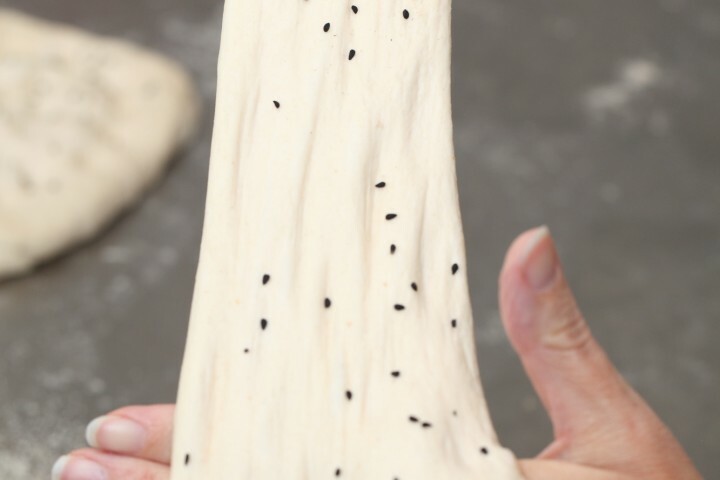 You must give it a try and make this bread with the seeds! 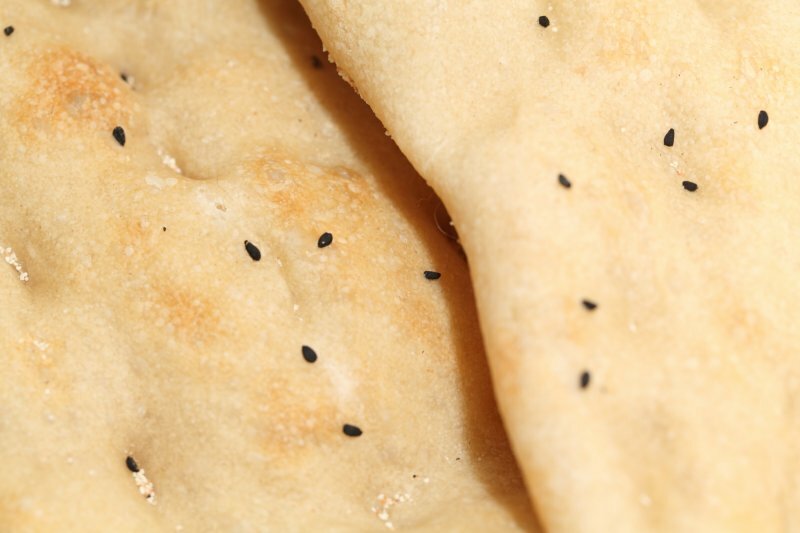 So, in short, you are looking at a naan style flatbread, but the original shape, the method plus the addition of the lovely black seeds gives it a unique character. 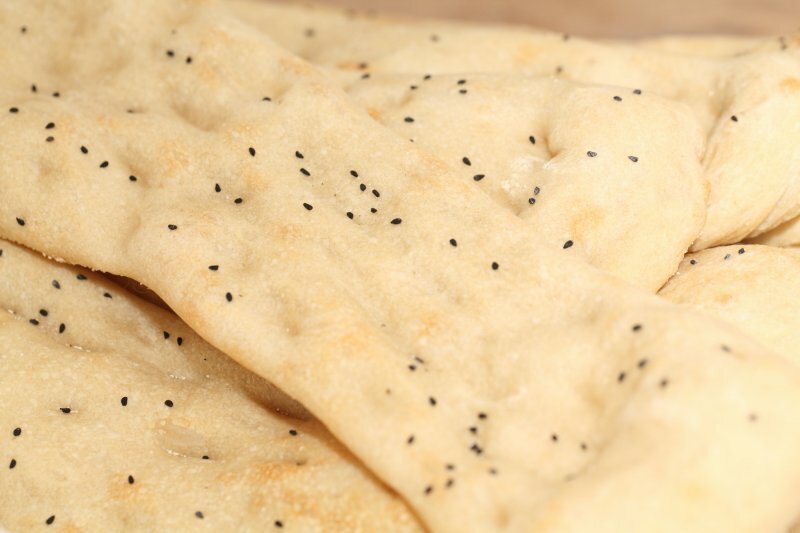 I found it even more versatile than Indian naan or pita. You can use it to accompany any spicy meal, but you can also fill it as you would pita bread, or turn it into an original toasty or (grilled cheese) sandwich. 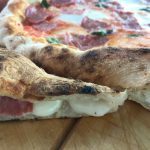 You can play around with the thickness, leaving it thicker and fluffy like a pillow, or stretch it further and have more crispy bits. Hope you enjoy the making and eating of this bread as much as we do and these shoes fit you too! 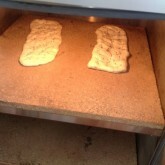 This is our interpretation and adaptation of the recipe in the flatbread book. In the original recipe the preferment is made with hard whole wheat flour. 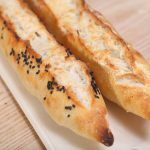 We have made this version too, and it is great, but the consistency of the dough (with our whole wheat flour) is slightly more slack and more difficult to handle, especially the ‘getting the long breads onto the hot stones’ bit. But you can try both and see what you prefer. Make the poolish by mixing flour, water and yeast with a spatula or dough whisk until well combined (about 30 seconds), cover the bowl with clingfilm and leave to develop at room temperature for 12 hours. We make our poolish in the evening, just before bed and continue the following day. 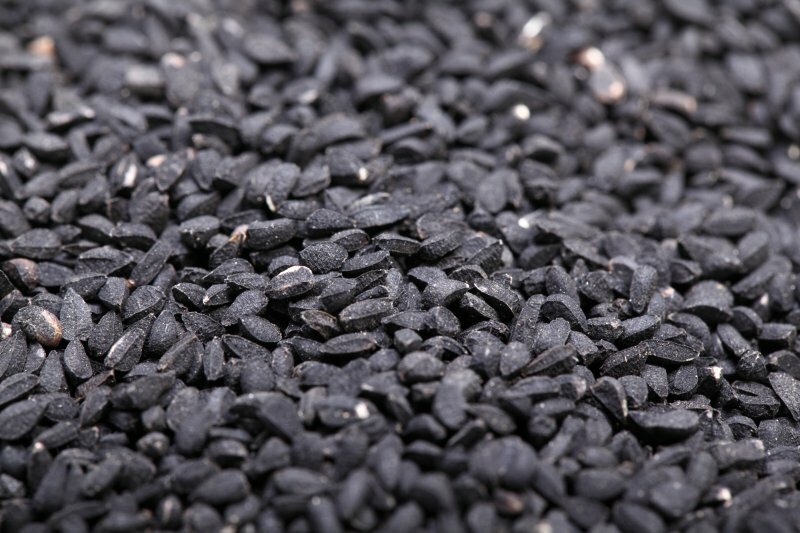 Nigella sativa seed is sometimes also referred to as fennel flower, nutmeg flower, black caraway, Roman coriander, and also black cumin. Scoop the prepared poolish in your mixing bowl. Add flour and salt. Now add the water and knead in your mixer with dough hook for 7 minutes (you can hold some of the water back and see how it comes together first), until the dough is smooth and slightly sticky (by hand it will take 10 to 15 minutes, depending on your technique). 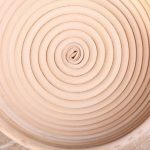 The dough should clear the sides of the bowl but stick slightly to the bottom. Transfer the dough to a greased bowl, cover and let it proof for about 3 hours in a warm place. You should really see an increase in volume. 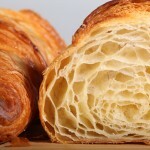 Make sure your dough has the right temperature to correspond with the proofing times. Also see our tips on the subject here. Preheat your oven with baking stone or tiles in it well in advance. 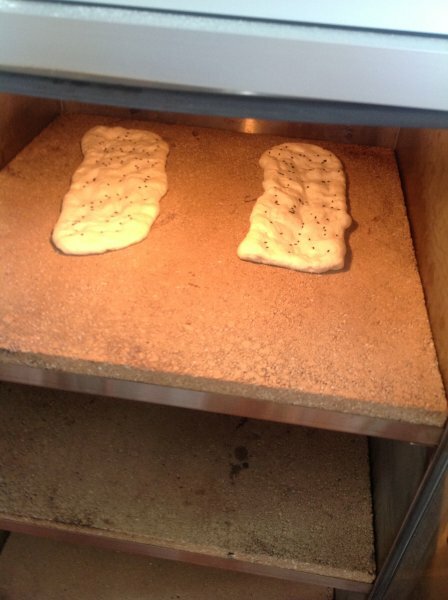 The temperature should be a solid 250ºC / 480ºF when the breads go in. 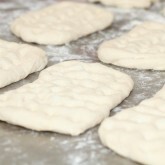 On a floured work surface, divide the dough in 8 equal pieces of slightly over 200 g each. You should end up with 8 rectangles of about 20 x 10 cm / 8 x 4 inches. Cover them with floured or greased clingfilm and let them proof for 30 minutes. 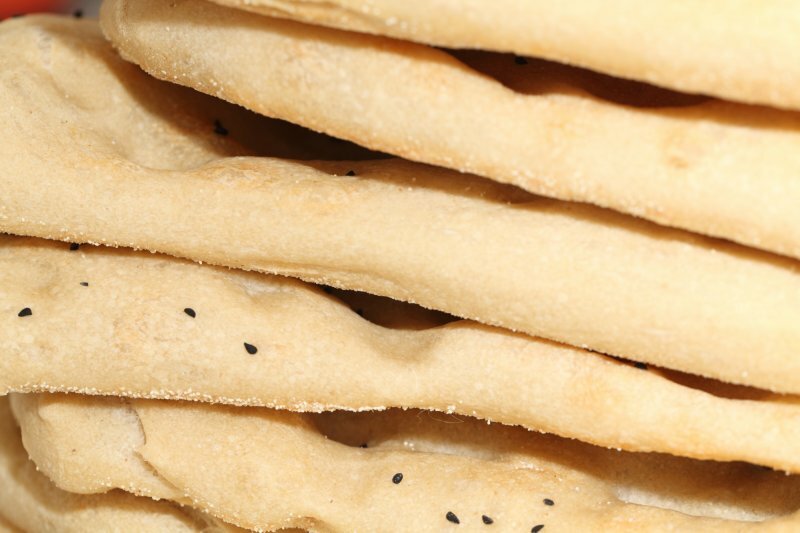 If you are going to use bread peels to help you load the bread on the baking stone or tiles this is the moment to prepare them with some semolina or rice flour. Uncover the dough rectangles. 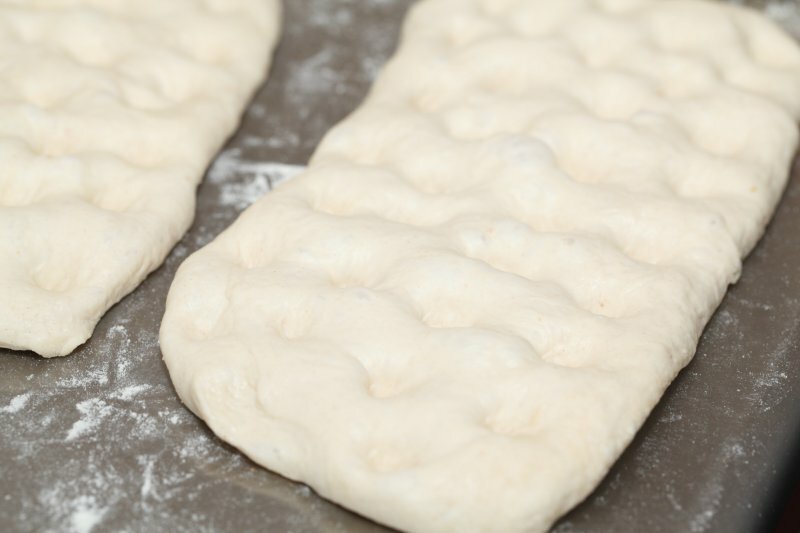 Have some water at hand, dip your fingertips in the water and make tightly spaced, deep indentations all over the surface of the dough. 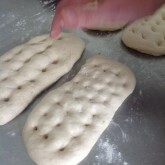 Now comes the fun part: Stretch the dough by draping both ends over each hand and gently pull the dough apart. 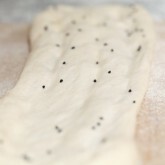 The dough should easily stretch and give and at no point tear. 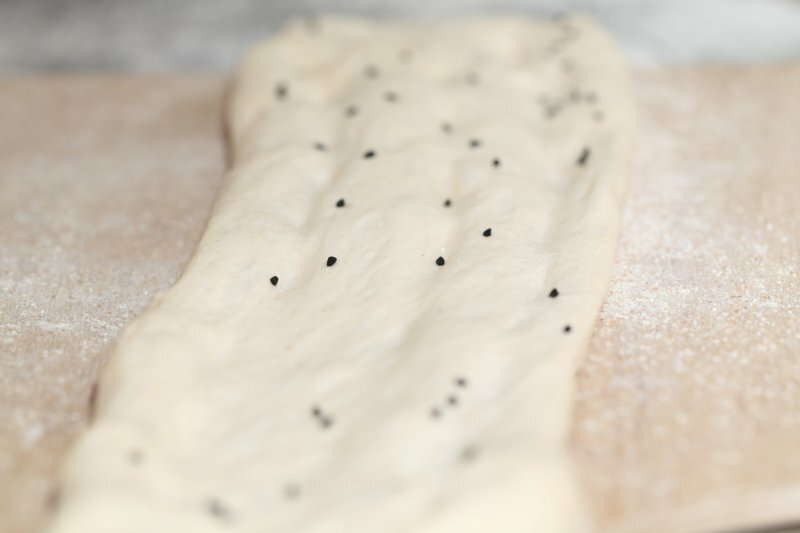 Elongate the dough as far as it will go or as far as you want, to achieve the required thickness. For a lot of ovens it will be practical to not go beyond 40 cm / 16 inches. 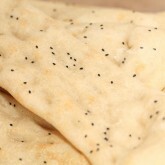 Very lightly spray or brush your breads with some water and sprinkle each one with some nigella seeds. 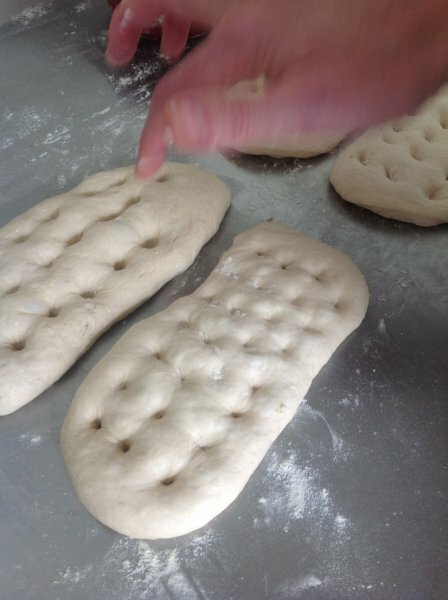 Now place a bread on a bread peel and, depending on the oven space, place the first bread or breads in the hot oven, directly on the hot stone or tiles. 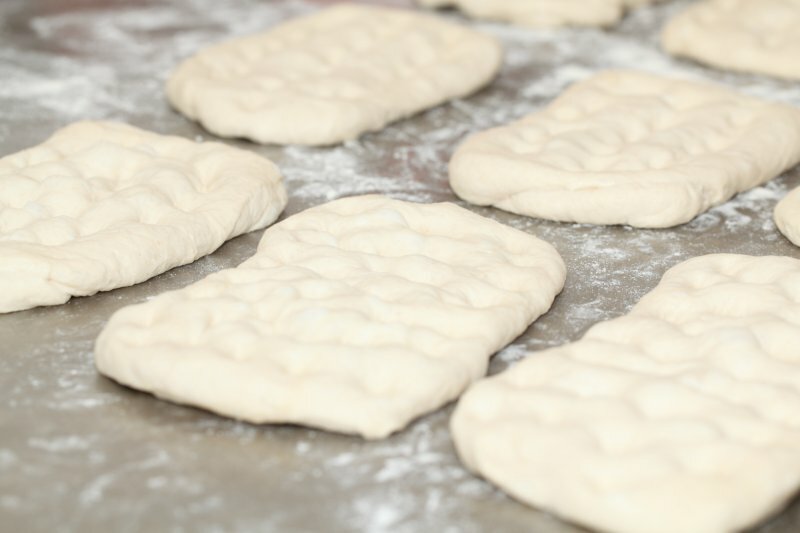 Alternatively use both hands to lift a piece of dough and carefully place it directly on the hot stone or tiles. 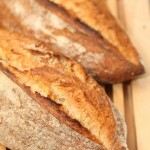 It works best to shape and prepare the next bread or breads while the first batch is in the oven. Bake the bread for 5 minutes. They are ready when you see light brown patches appear on the top. Depending on what you plan to do with them you can leave them a bit lighter (when freezing and toasting) or darker (immediate eating). If you want to keep them warm and soft, wrap them in a tea towel or cloth. The bread also freezes well. We get a piece out, quickly give it a 30 second full blast in the microwave and then put it in the toaster. Almost as good as fresh! 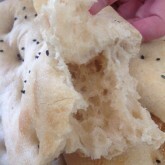 In the book there are recipes for chicken kebabs and mint yoghurt sauce, both perfect to pair with the bread of course. 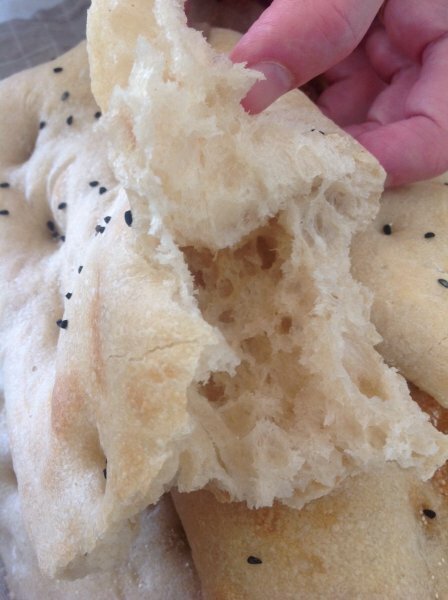 Just make sure you have your curries or kebabs ready when the bread comes out of the oven! Hi WB , just a quickie how much of the rye sourdough starter could I substitute for the quick yeast ? We have not made this exact recipe with a sourdough poolish, but if we did we would start with 40 to 50 g of active sourdough added to the poolish instead of the yeast. 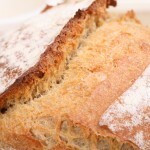 What a great recipe and lovely website! I lived in Berlin for many years and these loafs were a go-to for my best friend and me: once a week we’d go to our favorite bakery and share one, fresh out of the oven and covered in olive oil. Sometimes we were too late, and a Turkish family had just picked up ten loafs at once, and we had to come back the next day. I tried to reverse engineer them for myself once I moved overseas, and I found that the best versions was a “lazy sourdough” version in which my poolish (and, honestly, the entire loaf) consisted from leftover pizza dough I had forgotten about and just baked two days after making it. Thanks for your inspirational comment. This is one of those examples where ‘being lazy’ actually pays off. Excellent! Let us know how your ‘Spanish’ version turns out Abel! Looks great! Can I use fresh yeast instead? Yes, you can no problem. Use 3 grams of fresh yeast for this recipe.